We are proud to announce yet another business that is happy with their new website! 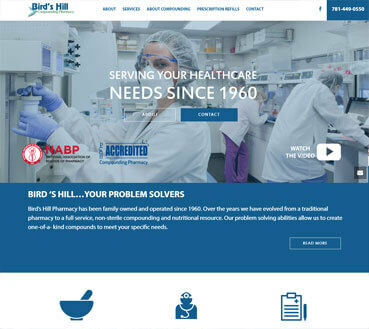 CRS Web Designs created a new website for Bird’s Hill Pharmacy. Bird’s Hill Pharmacy in Needham, MA. needed a redesign. CRS up to the task , as usual. Remakes are now more commonplace than web design from scratch. Because good web design is now a requisite for a business, existing companies almost always have a website. The question is, is it a good website? If it has been more than 10 years the answer will almost always be “no”. As I mentioned before, there is no timeless website. Bird’s Hill wanted a site that is current with the best other pharmacies local to the Boston area. Here is what we created.